The Pink Panther video slot is a playful and unique cartoon-themed progressive slots game developed by PlayTech. As you would have probably guessed, it is based on the massively popular comedy series that dates back to 1963. It is a 5-reel and 40-payline slot, featuring wilds, scatters, free spins, 5 bonus games, as well as 2 mystery jackpots - the Minor and Major progressive jackpots where you can win big! The jackpot prizes are won by activating the bonus games in the Pink Panther slot, which are triggered randomly during the normal gameplay. You don’t even need to be betting the maximum amount of coins to trigger them. The jackpot game shows twelve random doors and you’ll have to choose which ones to open. Revealing 5 Pink Panthers wins the "Major Jackpot", 4 Inspector Clouseau wins the "Minor Jackpot", and if you don’t win either of them, you’ll get the opportunity to win a consolation prize. The coin values start from as little as $0.01 so the player can activate all the pay lines for just $0.40 a spin, which is not the lowest, but considering you’d be activating 40-lines, this allows you to create lots more winning combinations. Although you can bet up to a maximum bet of $800 per spin, which no doubt would satisfy the high rollers. The wins during the regular game offers generous payouts in its own right, but once you take into account all the Pink Panther slots bonus games and associated pay offs it's not hard to see why this online slot game is one of the most popular slots games played at online casinos. The 5 bonus games that appear during Pink Panther all feature characters from the series. Each of the bonus rounds has their own unique gameplay and rewards. Pink Pow - In this bonus game, 2-6 randomly picked reel symbols will turn into wilds anywhere on the reels to create more winning combinations. Crack the Pink Code - This is without a doubt the best bonus game. It is actually a two level bonus round. The first part involves carefully opening 10 safes to be awarded with free spins, multipliers or expanding wilds until you find the dynamite. Then you will get to play the free spins you were potentially awarded, hopefully with multipliers and expanding wilds. The Colour Pink - The Pink Panther and The Little Man will both paint numbers on the wall. The total is what you’ll be awarded in the form of coins. Wheel of Pink - In this bonus game, the Pink Panther spins two wheels. The outer wheel awards you with cash prizes while the inside wheel contains either re-spins or collect to determine how many times you can spin the outer wheel. Pink Trail - There’s also a risk game with Inspector Clouseau where you get the chance to double your winnings by finding stolen diamonds. You can collect the prizes or take a risk by continuing on but your winnings will be cut in half if you fall in a trap. Pink Panther slot is designed to work in your web browser via Instant Play mode available at all PlayTech casinos. This will adapt to your device's screen size and to whether you have a mouse or touch screen controls. You will also find this game in the standard PlayTech download client for Windows or Mac computers. The Pink Panther slot has plenty of features and bonus games to trigger and be awarded to you along with the random jackpots to keep you on your toes. While this is not a classic, it is entertaining enough to go back to, and certainly hold's its own against the majority of video slots out there. My one disappointment was that the music playing during the game is not the familiar Pink Panther theme tune. You can find this slot (along with 100's more from PlayTech, IGT and others) at the award-winning BGO. This trusted online casino offer new players 10 free spins without a deposit (keep whatever you win!). 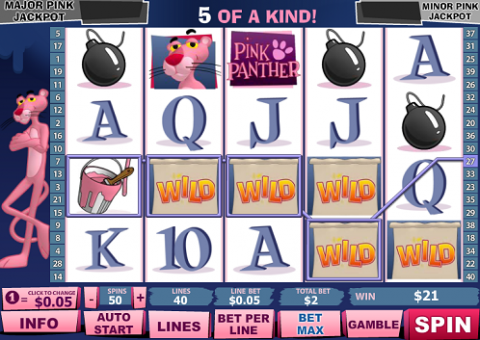 Check out this deal, and the Pink Panther slot at www.bgo.com now!